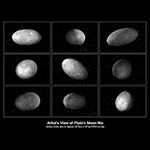 If you lived on one of Pluto’s moons Nix or Hydra, you’d have a hard time setting your alarm clock. That’s because you could not know for sure when, or even in which direction, the sun would rise. Why the chaos? Because the moons are embedded inside a dynamically shifting gravitational field caused by the system’s two central bodies, Pluto and Charon, whirling about each other. The variable gravitational field induces torques that send the smaller moons tumbling in unpredictable ways. This torque is strengthened by the fact the moons are football shaped rather than spherical. Reblogged this on Modern Astronomy.